There ain’t much right about that sentence, other than the last 11 words. Some day we’ll pull out another of Mr. Tapply’s gems like the one where he recommended carrying a gun on fishing trips because you can always just spend the day shooting crows, snakes, turtles and frogs if the fishing is slow. Native Americans served with honor during World War II. 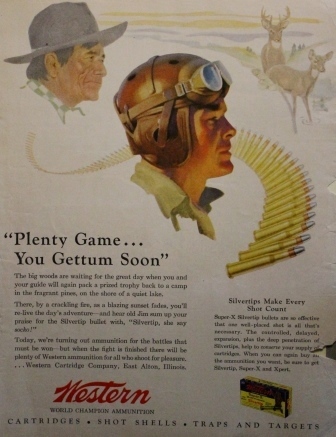 Western Ammunition was sending all its bullets to the war effort but promised “plenty game” when the war was over. 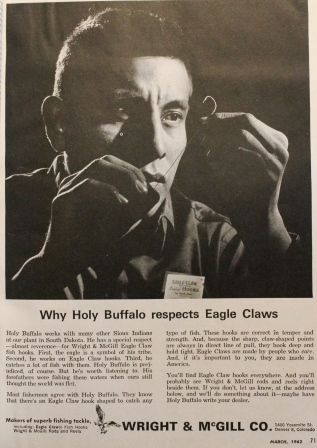 Even while recognizing their service, Western Ammo couldn’t help but fall back on the stereotype of Native Americans speaking broken English to establish the scene. In the documentary “Reel Injun: On the Trail of the Hollywood Indian” much is made of the way Indians speak in movies, including a segment of an old western, where what the director thought was gibberish is translated, revealing insults instead. Cartoons have not been kind to Native Americans. 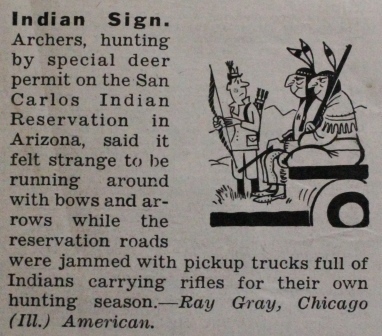 From an early ’60s issue of Outdoor Life comes this amusing anecdote, complete with an illustration that gets a small amount of credit because the Great White Hunter is not exactly given the Hero treatment. I lived in the Black Hills of South Dakota in 1981, just past the road to Victoria Creek, when the American Indian Movement established Yellow Thunder Camp in response to a series of court decisions regarding the Fort Laramie Treaty of 1868. 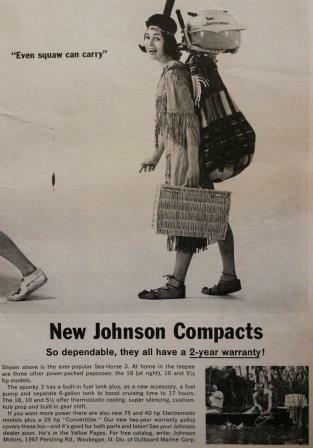 That was a tense summer and the armed Indians in pickup trucks that I saw didn’t do a whole lot of smiling. I can’t say that I blamed them and I am still grateful to the groups that took the time to talk to the stupid white kid in the Volvo. Humor is not always pretty, but it does not need to be offensive or perpetuate stereotypes. Every single one of us can be lumped by others into a category we don’t appreciate and most of us will sound off loudly when it happens. Unfair, untrue and disrespectful stereotypes exist for all of us and none of us like it when they are applied. When we plead with others to knock it off, we expect them to do so and show a little respect. Respect indeed. Well done, Quill. Absolutely, well done, Quill. Respect and Dignity are words we almost have forgotten! Well done, Mr Quill. We’ve not done a good job of righting the wrongs committed on the first Americans starting with “firewater”. Those of native american heritage on or off the “reservation” are still paying the price today. Great post about how we think and act. Thanks for keeping us grounded, Quill. Well said Quill. Meanwhile the folks in Boulder, Colorado are arguing about dog poop.